Part of me wasn’t expecting a Sabre puzzle this year… I think because he told me there wouldn’t be one! His last was that tricky Coincidence last December based on the times that hour and minute hands of a clock overlap. Before that, we had a couple of knight’s move puzzles, and a quick scan of the preamble indicated that we were spared another one this week. However, the preamble did have ten lines to wade through. Firstly, the 12-letter x and y coordinates of the grid were provided by part of a quotation, a quotation that seemed to have an awful lot of small words! The two unclued entries in the grid provided another six words from the quotation. Numbers in brackets were answer lengths, implying not the same as entry lengths, which was a bit of a bugger since the grid itself was carte blanche with a solitary cell under the bottom row. There were six clashes that “may be resolved into, and must be replaced by, characters of the author…”. Finally eight cells would need replacing. Examining the across lengths, there were two 10-letter, one 11-letter and three 12-letter answers. Down we had one 12-letter, one 9-letter, one 8-letter, and then a whole slew of 3-, 4-, 5, 6- and 7-letter answers. And yet the grid displayed 180° symmetry. How was this going to be possible? Well, stage one was to solve some clues. I attacked the long entries. AAac Rossini diva, often left in perplexed state, hiding close to garden shrub (10) seemed to have too many wordplay indicators for easy solving (perplexed, hiding, close to). However, the following clue 500lb you replaced two times (6), while leading to DOUBLY was also AAac. This confirmed what was fairly obvious earlier, namely that the coordinates above and to the left of the grid had duplicate letters. I started my list for the across answers and added another for the downs. Back to the long answers, and a quick check with Mrs B helped get NOTODONTIDAE for the moths at AY. I failed with the anagram of NUMPTIES [rus]H and [informall]Y at SO, primarily because it wasn’t the Y of informallY but N for ‘and, informally’. I had success with other anagrams at AD STORM WINDOW, AI UNFATHOMABLE and ND WITHSTANDING. At this point, the ND of the last seemed to conflict with the AD and AI of the other two. Obviously, there were destined not to start in the same column. Yikes! It was at this point that, in addition to my two lists for the acrosses and downs, I added one for the names that I was going to call Sabre when this was all done and dusted! My list of answers gradually grew. The 12-letter at DSdn Owner of digs converted army’s dwelling in lodge (12) for QUARRYMASTER took some time to solve, but when AAac yielded BUFFALO NUT, I felt I had enough to start trying to construct the grid. It seemed that ABUSED would be the top left down entry, and would enable BUFFALO NUT to go across with QUARRYMASTER down near its end. It was obviously necessary for this to be much shorter than 12 letters, and eventually (not before time, I hear you mutter), I realised exactly how many letters may need to be scrunched into some cells. “Clashes” indeed!! “AND WHO ARE YOU?” SAID HE. This is from The Life and Opinions of Tristram Shandy, Gentleman by Laurence Sterne. All that was left (yes, I’ve used that expression before to my cost) was to fathom the characters required in those clashing cells. Having RRYMAS and ITHSTAND in the top right quadrant shouted out TRISTRAM SHANDY, and the others were soon revealed to be WIDOW WADMAN (storMWINDOW/ADWAres), YORICK (rorO/haYRICK), UNCLE TOBY (doUBLY/CENTOist), CORPORAL TRIM (ROOTLike/CRAMPIRon) and DR SLOP (SParre/naiLROD). These characters needed to be replaced by characters from the author, ie STERNE, to give real words in the final grid. The R replacing TRISTRAM SHANDY was the titular character who needed highlighting. Finally, the second part of the quotation needed to be revealed in the grid by changing eight letters. Changing PUNISHMENT, RASPY and SCANTS to PUZZLEMENT, RASPS and IDANTS, gave DON’T PUZZLE ME, SAID I in rows 10, 11 and 12, with the I going into the solitary square below the grid. What a phenomenal find by Sabre, those seven six-letter sequences. And what an incredible feat to cram all those thematic elements into a 12×12 grid. As a tour de force of the setter’s art this must be up there in the top three puzzles vying for the Gold Cup this year. I’ve torn up the list of names that I was going to call Sabre. This entry was posted on 30 October 2015 at 4:00 pm	and is filed under Solving Blogs. You can follow any responses to this entry through the RSS 2.0 feed. You can leave a response, or trackback from your own site. “It seemed that ABUSED would be the top left down entry”. Alan, I think I should have used “could” rather than “would”. 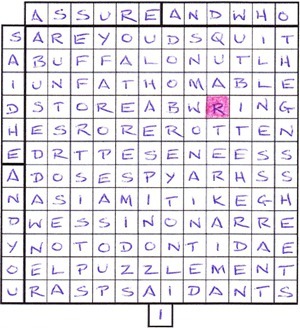 Being a first column entry seemed a possibility from the fact that two of the three 12-letter across clues also began with coordinate A. Then it was just a case of trial and error, starting with the top of the first column and seeing what happened. Of course, it could have turned out to be a column 7 entry, but luckily wasn’t.